Basics for Women - "A Parcel of Strouds, Duffields, Blankets, Silver Trinkets and other suitable Articles for that Trade." Linda Welch Ricker, Denise Tomlin Adkins, and Bronwyn Cunningham. Photo by Doug Walsh. Women have a bit of an easier go than men. They don't have to worry about buying a gun, powderhorn, pouch, war club, spear... and so on. And you ladies don't have to really worry about showing up for the war parties wearing too much stuff! Women also have a little bit more variety where some items are concerned. When it comes to men's dress, I harp on the fact that the best odds for colors were found in the early 1750's where the average was 4 yards of blue to every yard of red. Most descriptions of men's clothing say blue blue blue blue... because of this, I get the sneaking suspicion that the bosses... I mean women... got the majority of the red wool. Wrap Skirt: North and South, the wrap skirt is the defining women's garment. It is typically made to wrap around the waist almost one and a half times. The top end was secured by some type of belt, which the excess folded over. The two short sides and bottom were typically decorated with multiple rows of silk ribbon, beads and silver shirt buckles (forget the big pierced silver pieces, they didn't come around till very late in the century). Red, blue, green, yellow, and black ribbon were the most common colors seen. Red and blue wool were the dominant colors. Green was also used, but comparatively rarely. The interesting thing about the SE which disturbs NE folks is that the women often wore their skirts really short during the hot summers! A note about fabrics other than wool: Linen, linsey-woolsey, and other fabrics were definitely used by Southeastern Indian women for skirts. How they were made is not as clear. These were a people quite adept at sewing so it would not be surprising to learn one day that they were making the lighter fabric skirts similar to the way European women's skirts were constructed; with a gathered/pleated waist fitted into a waistband, which tied closed. Shirt/Shift: Native women clearly had a few options for covering their upper bodies. In the 18th century, it was common practice to go shirtless, like the men. For the sake of modern social norms, this is frowned upon. A typical man's trade shirt made of either white or check linen was commonly worn by Indian women. Just as common was the European women's shift. With either option, it would be ideal to refrain from applying extra decorations besides silver shirt buckles. Bedgowns: Indian women were quite fond of wearing bedgowns and jackets. This is yet another example of the way Natives adopted European clothing to their own needs and wants. The bedgown was quite commonly made of printed (please see the article "Deciphering a Trade List" for hints regarding appropriate prints) linens and cottons. There are a handfull of references to them being made from woolen fabrics as well, which would serve well for the colder months. No matter what material they were made from, the bedgown was most likely left hanging open but could also be pinned closed just as easily. Leggings: Women wore wool leggings, just like the men did. It appears to have been common practice to wear them only in the colder months of the year while going bare legged in the summer. Women's leggings were constructed just like men's. They reached from the ankle to about a hand's width above the knee, featured a flap on the outside of the leg 3 to 4 inches broad, and was secured to the belt around the waist by a strip of fabric. The flap was often decorated with silk ribbon as well as white beads. Garters: Garters were worn below the knee to hold up the leggings, but also for decoration. For the majority of the 18th century, the oblique pattern of finger weaving dominated. Other styles really did not seem to show up until very late in the 18th century. It is possible that the diamond and chevron may have started appearing as early as the late 1770's, but it was rare. Heddle woven bead garters are another option commonly seen in the SE during the period. Of course, plain wool twill tape is always and option too! Matchcoat: No Native woman should be without her matchcoat. A matchcoat is simply a rectangle of cloth, roughly 60" by 65". If we follow the historical record, blue wool was the most common color throughout the entire 18th century. It can be decorated with silk ribbon, beads, and even ring broaches. It could also be left entirely plain. Most images of decorated matchcoats display upwards of 7 lines of silk ribbon on one side and all the edges bound with ribbon. Either way, every single woman should have one. Blanket: Just as important as the matchcoat, blankets were very important, especially in the colder months. Duffel blankets were probably the most common in the SE. They were white, with one to three colored stripes on each end. The stripes were most commonly red or blue. There is little information supporting "half blankets" or decorating blankets. However, a blanket could certainly double as the matchcoat! Tumpline: To transport deer hides to market, blankets and food while traveling... or whatever... the tumpline was the Native way to go! The safest direction to go with a tumpline is the undecorated, woven variety (avoid jute at all costs! Use hemp, dogbane or something similar). There are many originals which survive and they all have remarkably similar features: A twine woven center section typically measuring about 22" long by 2" wide. The two ends of the woven section taper into oblique woven tails measuring at least 6' each, with the last 1 to 3' split. Tumplines may also have been made of buffalo hide in similar fashion to the woven cordage variety. Sashes and Bags: As of yet, no one has been able to turn up a single shred of evidence to support women in the 18th century wearing sashes over their shirts and around their waists. So please do not do it! Doing so is not rooted in anything but fantasy. Likewise, there is no evidence for the wearing of bags with a shoulder strap. That said, if you need to carry stuff around, why use a twined bag? Twined bags are known to have been extensively used for storage. They came in many sizes from small "clutch purse" size, to great big bags you could fit a body in. And they can be made in various patterns and colors. Jewelry: By all means, accumulate some bling! The trick is to get the right bling. Silver ball and cone earrings were super common. Silver ring broaches/shirt buckles were very very common. In the SE they were also often heart shaped... but all made from half round wire. Avoid the elaborately punched thick silver broaches and even ear wheels. Beads were very commonly seen around the necks, wrists and even ankles of Indian men and women in the SE. As with silver, it is important to be very picky about the beads you use. Most "trade beads" on the market are crap. Avoid chevrons and the like. They are way wrong! 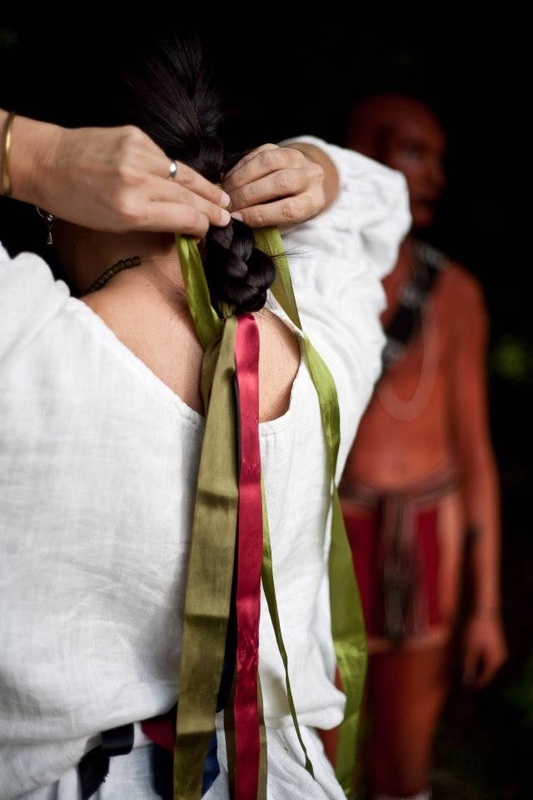 Get a few yards of various colored silk ribbon to wrap around your hair bun! Simple silver hair plates even started showing up in the 1750's SE! While you are at it, put some red paint in the part of your hair and on your forehead. It will keep you from burning and looks pretty! Knives: Last but not least... the all important knife! Folding knives were traded in the thousands in the SE. So were fixed blade "scalping" knives. Every woman should have a knife in her kit... but please do not feel the need to wear it on your body. Keep it in your storage bag for when you need it.